Take the Fair with You! 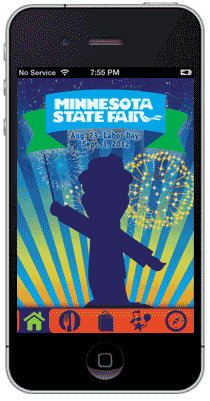 Search the iPhone App Store or Android Market to download the Minnesota State Fair App. It’s absolutely free and features our famous Food Finder, Fun Finder and Merch Search tools to help you find your favorites at The Great Minnesota Get-Together. Available now absolutely free at the App Store or Google Play store. 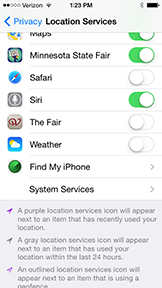 ATTENTION: If you are experiencing difficulty with the State Fair App on an iPhone with iOS8 or higher installed, turning location services on should resolve issues. Go to Settings>Privacy>Location Services, then locate the icon for the MSF app and turn on. When you are on the fairgrounds, the Food Finder and Merch Search will give you the option to display vendor search results in two ways! You may toggle between proximity-based results OR alphabetically-listed results simply by touching the Food Finder (fork & knife) or Merch Search (shopping bag) icons at the bottom of your screen again. Available now absolutely free at the App Store or Google Play store.